You are here: Home>Archive>Collection of Material relating to Daphne Joy Drew. Collection of Material relating to Daphne Joy Drew. Collection of Photographs and postcards relating to Daphne Joy Drew. 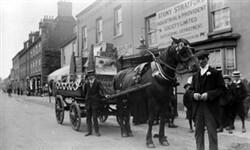 These include photographs of airships and Biplanes from the First World War; the Army Manouevers in Wolverton in 1913; various scenes from Stony Stratford; Wolverton Works; and businesses and buildings. 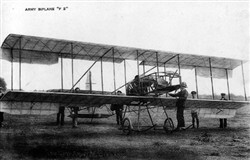 Collection of photographs showing an Airship at Elstow, the Army Airship Gamma, Army Biplane ‘F2’ and a Farman Biplane descending after a good flight in 30mph winds. 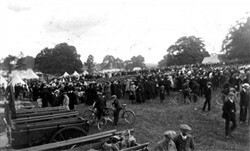 2 photographs are of Army Manoeuvres at Wolverton and show men, women and children assembled in a Wolverton field. 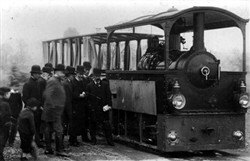 Miscellaneous collection of photographs, including the cemetery at Cosgrove, the doorway of the Glynne Arms, men leaving Wolverton Works, an old Street scene with a lone man standing in front of a derelict building, a Save the King parade of children, and a Steam train at Wolverton works. Collection: Collection of Material relating to Daphne Joy Drew.